When you take some property on lease or buy or sell any property, you have to enter into commercial agreements. But, it is not an easy job to get an agreement ready. Being a legal document there are many points to be included. This detail list of Commercial Agreement Form – file format includes generic format that may be used for making commercial agreements. These Agreement Forms also cover provisions for legal remedy when the contract is dishonored. 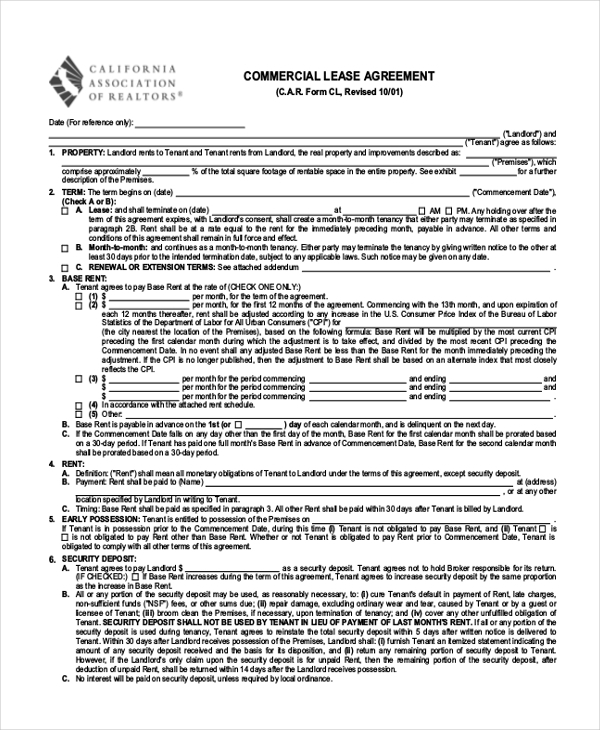 This six page lease agreement of California Association of Realtors is useful for commercial tenancy. It includes details of the landlord and the tenant and covers all other relevant points. This template gives the detailed requirements of lease agreement for vacant land. It covers the term, rent, prohibitions, right of way use, repairs and maintenance, taxes and other terms and conditions. 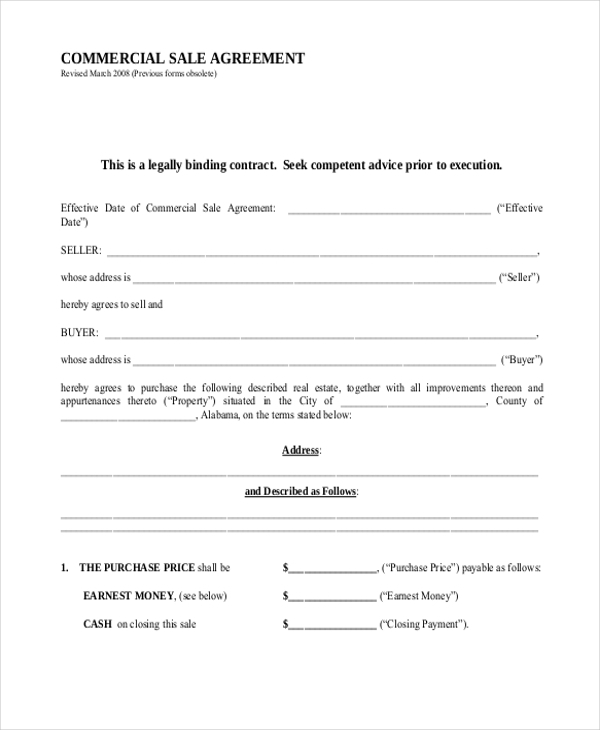 You may also see Purchase Agreement Forms. 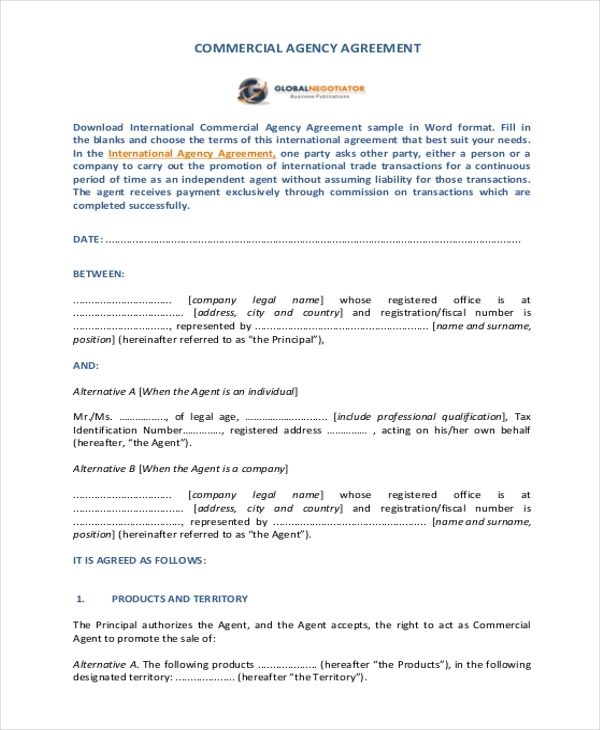 This is a downloadable agency agreement template is in word format. It covers relevant points like products and territory; roles and responsibilities of the agent, and also includes a user guide. 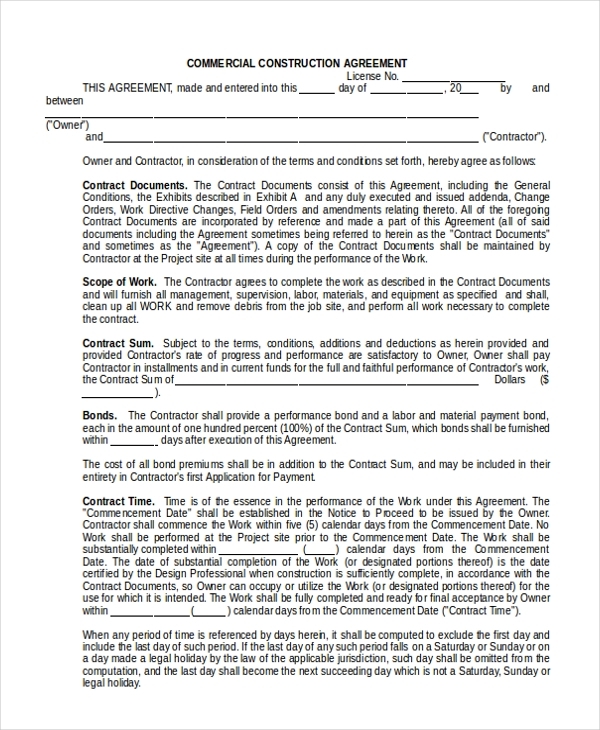 This downloadable template in word format is for using by the owners and contractors for entering into an agreement. It includes the scope, sum involved, contract time, conflicting provisions, waiver etc. 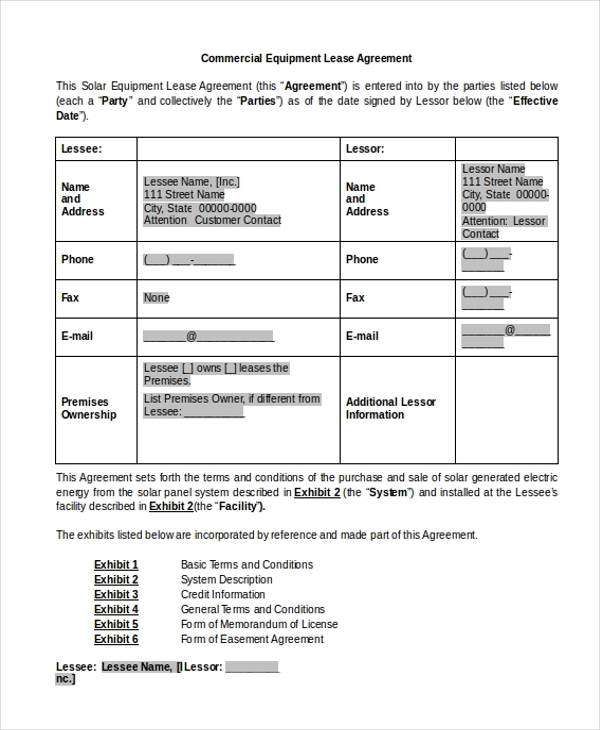 This template can be used for entering into an agreement between a company and its commission agent. It includes sales territory, products, commission to be paid, tenure, compensation, and arbitration clauses. This commercial trade agreement template covers all relevant points in a very structured manner. It includes business details with contact person, pallet management, trading terms and conditions of carriage and storage. This eight page template in PDF format is useful for selling properties. This legal document includes property details, agency disclosure, purchase price, inspection criteria, earnest money, agent commission and other terms. This PDF template describes information required for buying and selling in a structured form. It includes property description, price, due diligence, mineral rights, and other terms and conditions of the agreement. You can also see Buy-Sell Agreement Forms. This sixteen page PDF template is useful for real estate purchase and sale. It includes nineteen articles covering all relevant points for transaction and further includes seven exhibits for detailing status. Who Can Benefit From These Templates? 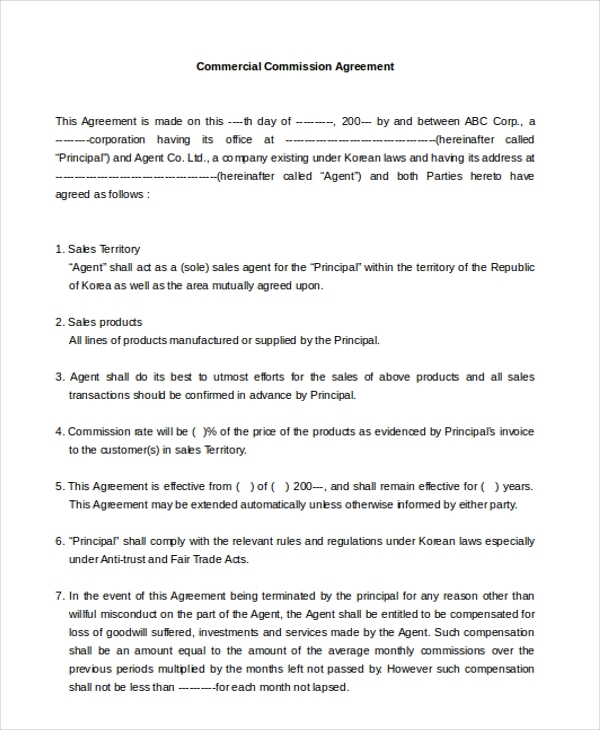 Commercial agreement is a contract entered between two parties. 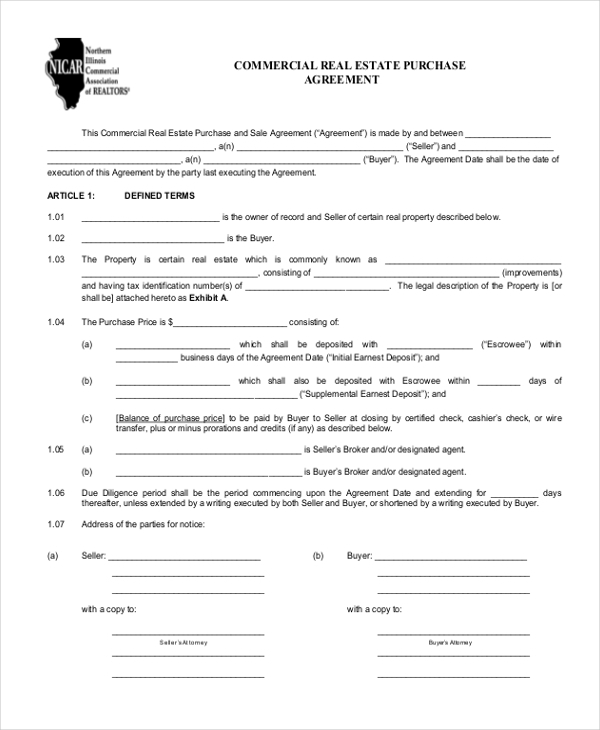 Any individual or organization willing to give a property on lease or sale or purchase or making trade agreements with someone, may use this Commercial Agreement Form – file format for making it legally binding. Sometimes, agents may also be a party to the commercial agreement. The main point of these agreements is that it covers all legal requirements so that any of the party may ask for legal remedy when the other dishonors the agreement. 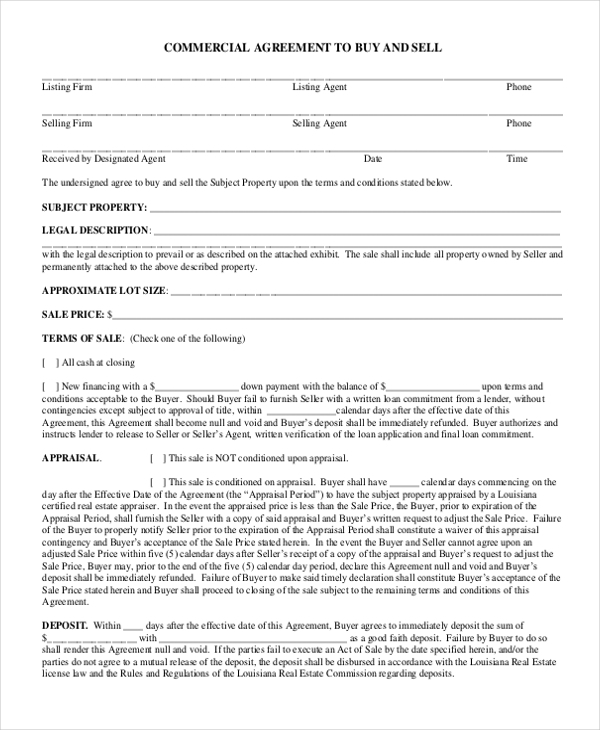 You can also see Sublease Agreement Forms. How These Templates Can be Used? Commercial agreements provide better protection against breaches. Using the Commercial Agreement Form – file format is very simple. These templates have blank fields against each relevant point. One can download the format applicable to his purpose and complete the form by filling up the blank fields against each relevant point in the template. For a lease agreement, one should start with the names of the lessor and the lessee and then fill up other fields to generate one’s own commercial lease agreement within a few minutes. You may also see Business Partnership Agreement Forms. Commercial agreements have complex nature. These need to be in compliance with legal requirements. To make a contract legally sound you have to take professional help that costs large sum. You can save both money and time by using the Commercial Agreement Form – file format for creating your own contract.